Reclaimed granite and a one-of-a-kind beach stone bring artfulness to your cooking routine. Arra David and Anne Johnson were like you: Tired of dull, everyday kitchen tools. So, they took a hint from their seaside surroundings and turned a common design into something extraordinary. They handcraft this spoon rest from reclaimed granite and found beach stones to give your kitchen a hint of coastal charm. Give the unique piece to a new home owner, or keep it for yourself to infuse a little artfulness into your cooking routine. Handmade in Windham, New Hampshire. Make it a kitchen set, and pair the Sea Stone Spoon Rest with our Sea Stone Splash Sponge Holder. I bought this to match the sponge holder I already had. Absolutely love the sponge holder. The spoon rest stains, which is not very useful for something that is intended to hold spoons while cooking. Also, the handle rest is to too long for some spoons. I had gotten one for myself last year and gave one as a Christmas gift. I would buy this as a gift for friends! No complaints about this product. It does what it's supposed to do and it does it with style. Lovely spoon rest that is like nothing you can purchase in a store. Smooth stone and well balanced design. My mother in law loves it! 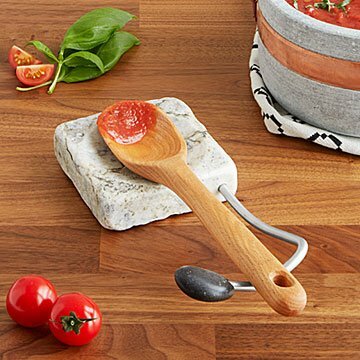 My mother in law loves to cook and said this spoon rest has made cooking and cleaning up in her kitchen sooooo much easier! The spoon rest's earthy and ingenuitive design adds to every kitchen. I would definitely recommend and re-order this product in the future. I use this spoon rest every day. Love that it is big enough for my wooden spoons! Keeps the spoon in its place! I love the way it keeps the handle up off the counter. Received this as gift from my husband's parents. Very thoughtful, however it is extremely large for our kitchen. Unfortunately this will remain in the box given the amount of room it will take up on our counter top.